How can I teach TA to new clients?? That is a challenge. Even though TA is simple and effective, there are so many definitions and diagrams that clients (and new therapists) can get confused or overwhelmed. When I was an organizational trainer, I learned three elements were necessary to convey new information in an effective way. 1. Good visuals 2. Simple definition/diagrams 3. A good story. These 3 elements help clients and students absorb the new data, and gives them a system and structure for continued learning, and relates the information to their lives. “A picture is worth a 1000 words.” When I drive to a new location, I need a road map. I need to see how I am getting to my destination. I need to see the journey as a whole, ‘the big picture’. Unless I get the big picture, I don’t grasp simple concepts. But since principles for personal growth are abstract and conceptual, how can I put those concepts in visual form? I came up with a visual tool that includes seven basic TA principles—belief systems and behaviors—that contribute to an authentic life. I put it in an electronic book, called “The Seven Principles for Creating an Authentic Life.” I use the picture (and metaphor) of a flourishing tree to represent an authentic life. Most people can understand the principles of nature. They know a healthy tree needs two things-a good root system, and strong branches. The root system requires good, rich, nourishing soil ( in order for the roots to grow deep into the soil). A good root system provides stability and strength. As a result, the tree emerges with strong, healthy, flourishing branches. A flourishing tree is a metaphor for a flourishing life. This diagram shows two TA belief systems and five behaviors that contribute to an authentic, flourishing life. The Seven Principles helps clients see how belief systems (root system) and behaviors (branches) come together to create an authentic life. 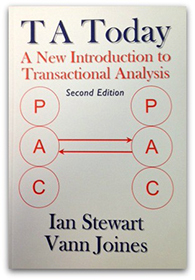 I teach my clients and students seven basic TA concepts using short, concise phrases. So Principle 3 “Understanding Self and Others” represents a BIG, complex subject, but it is summarized in simple, easy-to-remember terms. I explain that each principle has a corresponding TA diagram that we use to understand our belief systems and behaviors. And as in nature, I gently remind them that change and growth takes time. Changing ones’ belief systems or learning new behaviors requires persistence and patience. 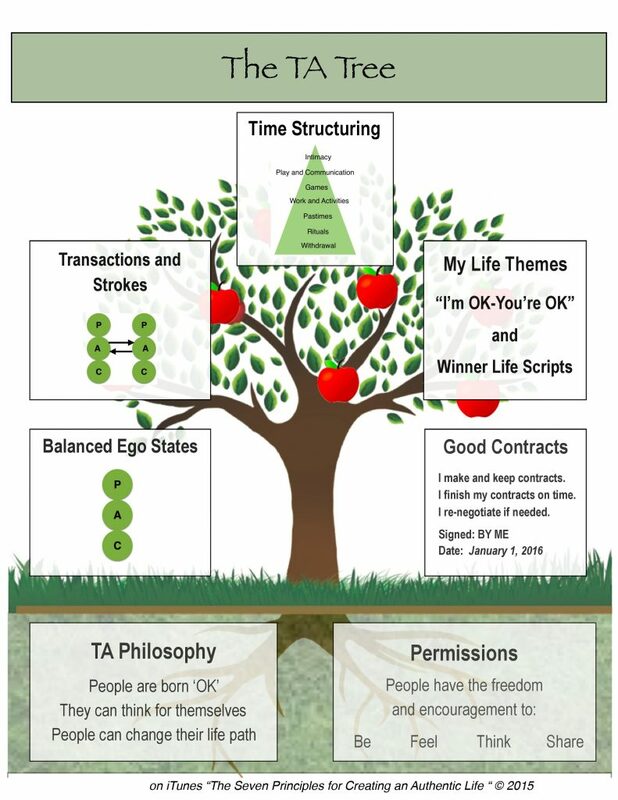 The TA Tree is a simple reminder of the tools they can employ to work on these area of their life. This is the story I tell my clients/students about using The Seven Principles with an actual client. A few years back, a physician came to see me. She was recently divorced, depressed, and desperate. She also was impatient, and wanted good results now. I said “When you see a new patient, how do you proceed on the first visit?” She said, “I take a history. I rule out what does not apply to the patient. Then I come up with a treatment plan”. I told her we would do the same process. After explaining the Seven Principles, I asked her to identify areas she was already doing well, and areas she needed work. She said “My childhood was fine. I think I have good foundational beliefs about life. But I have been told I talk down to people. And I work too much.” Together, we identified 2 areas for work— good communication (principle 4) and Time Structuring (principle 5). We made a contract to address these 2 behaviors and skills (treatment plan). As we continued our work, other principles came into play. But she was very clear on what she wanted, and how she could get there. The Seven Principles Tree helps clients can see the ‘big picture’. They can choose the areas on which they want to work, and ‘rule out’ areas they are already doing well. In my experience, most clients want to focus on 2-3 areas. This clear direction for the counseling process gives a client confidence and hope. Throughout the process, they can refer back to the flourishing tree, and remind themselves what it takes to have a authentic life. 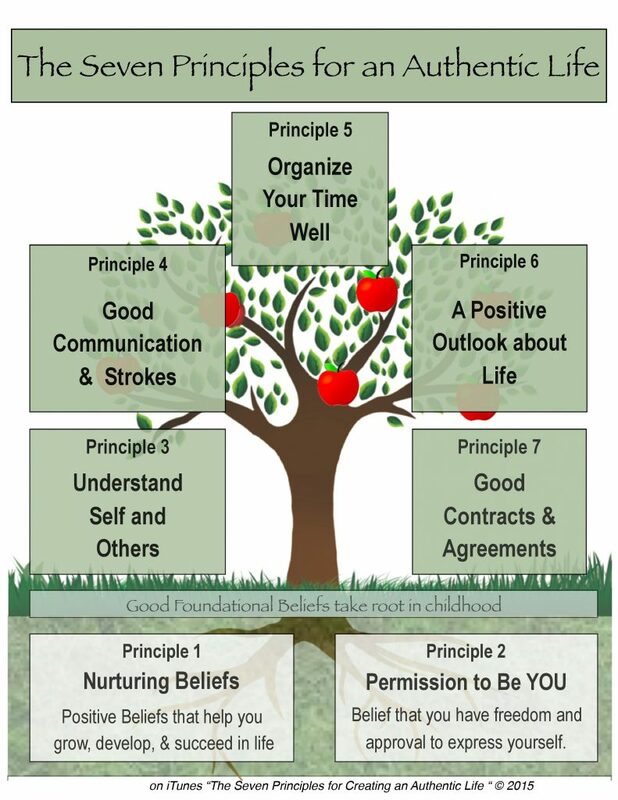 For TA teachers, The Seven Principles Tree and The TA Tree gives them a visual tool to teach TA belief systems and behaviors. They can post a copy next to the dry erase board, and refer to it during sessions. It makes their task to teaching TA easier, and can be taught to individuals, couples, families, businesses, and groups. It serves as an introduction to TA. It is my hope that is it is a springboard for more TA exploration. 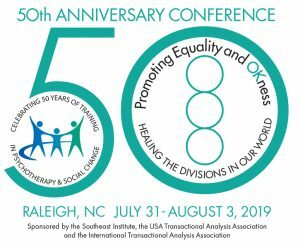 Practitioners of Transactional Analysis were interviewed on their use of and appreciation for TA during the 2013 USATAA conference. USATAA proudly re-posts this wonderful video that features highlights from several of those interviews. Our tradition of dynamic social justice expands with USATAA’s Social Justice Committee inauguration. Social action traditions among transactional analysts began in 1961 with the San Francisco Social Psychiatry Seminars sponsorship of George, a six year old boy from Crete, whose father was killed by an abandoned WWII mine. This Social Justice blog will serve the dual purposes to recognize and build upon the social activism of our colleagues engaged in social justice work and record developing social justice theory and practices. 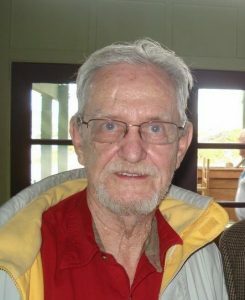 This inaugural Social Justice Committee blog remembers and celebrates two courageous social activists and transactional analysis colleagues, Josephine Bowen Lewis and Denton L. Roberts, Jr, who passed away in the last few years, and passed the social justice torch along. We want to honor their accomplishments and leadership with their pictures and the reflections of those fortunate enough to know these loved USATAA members. We remember Jo and Denton for their years of expertise, devotion, and love to our organization. Jo Lewis was an inspirational therapist and international speaker and change agent. 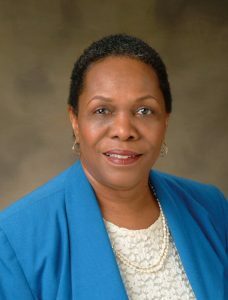 She co-founded the Center for Cooperative Change, held an Associate Trainer appointment at the Southeast Institute for Group and Family Therapy, and served as General Coordinator for USATAA in 1998. She loved her role as teacher and facilitator at many TA conferences. When Jo passed suddenly in 2014, many were stunned at her unexpected passing. We could not quite believe it was true. We want to acknowledge and thank Jo for her friendship and her lifelong, significant contribution to this world and to transactional analysis. Denton’s friend and colleague, Bob Hill, eulogized Denton and praised his history of social activism, calling him “a raconteur with few peers, and a caregiver par excellence, a shepherd to church members, and a citizen of the world.” Hill notedDenton’s “unflagging commitments to do what he could in a world racked by pain and rocked by unrest,” adding that ‘from the hot days of Selma, to the poverty-scarred streets of South Central Los Angeles, to a nation inebriated on the wine of war, to the hallowed space of Ground Zero in New York City, Denton provided leadership and love, presence and prayer, counsel and creativity…..he kept his eyes on the prize of equality, loveable-ness, empowerment, and the precious value of every human being.” This eulogy emphasized Denton’s capacity to convey “calm to the distressed, peace to the tormented, challenge to the wandering, insight for the confused, grace for the troubled, humor for the overstressed, hope for the brutalized, and love for the abandoned,…while he “kept a firm hand on the plow that turned over fresh furrows for the individual… with clear-minded insights, an unfettered intuition that bordered on genius, and a deeply compassionate heart…. as he helped to strengthen and transform life-saving, life-giving institutions. More memorial tributes to Jo and Denton from friends and colleagues are excerpted below. Please add your own to the comments below. “It is with great joy and honor that I celebrate Denton and Jo’s social activism in ITAA, USATAA and in each of their professional and personal lives. In the introduction to his book, Able & Equal; a Gentle Path to Peace, Denton writes, “When people function from the basis that they and all people are capable, powerful, loveable, valuable and equal there exists what I identify as Human Esteem which provides the bedrock upon which peace is built.” In my experience, Denton Roberts operated from this premise in his relationships with all, both at the personal and institutional levels. His work at All Peoples Church in Los Angeles was indicative of his dedication to social justice. Jo and I worked together with Valerie Batts and other consultants at VISIONS Inc. to foster multiculturalism and confront racism, sexism, heterosexism and all other forms of oppression at all levels. With her husband Mark Wise, Dr. Bowens Lewis developed and operated The Center for Cooperative Studies in Atlanta, which touched many lives and organizations in support of justice. “Jo Lewis was one of my role models as a TA therapist. She supervised my first TA 101, giving feedback in a loving and confrontative manner. When it came to values issues in tough council and committee decisions, Jo helped us ground into what really mattered. She was a wonderful Child to Child playmate, whether we were out buying her a coat at a chilly San Francisco summer conference, or ordering luscious strawberries romanoff from room service after a tough day giving TA exams; Jo showed how to live life well. “George (Our sponsored orphan in Crete).” Transactional Analysis Bulletin 1:4. Oct. 1962. Since the 1960s when Thomas A. Harris, PhD./T.M. *, first introduced to his best-selling, I’m OK— You’re OK , (Harper & Row, New York, 1969), this phrase has been trivialized over and over again. I accepted the phrase wholly when first introduced to the concept. The concept was born in Eric Berne’s San Francisco Seminar Through the years I have become increasingly uncomfortable with the phrase. Many persons have argued with me that people’s behavior makes this concept false. A psychiatrist argued against the concept saying, “Watch out for ‘third-degree Bernes'”. Comedians have joked about in their routines for years. A New Yorker cartoon (1972)1 caption had a woman on a phone conversation saying, “We are reading “I’m Ok—You’re OK” and we’re ok because of the martinis, not the book.” Most usage, I believe, have missed the true meaning of the concept. My teacher, the late Morris L. Haimowitz, Ph.D/T.M*, said that I’m “OK—You’re OK” means, “I value myself and I value You.” The first time Morris mentioned this in my training group, I felt a breath of fresh air. He put into words what I had been feeling for years. Religious literature such as the Hebrew and Christian bibles support this concept “loving self and neighbor.” Jewish theologian, Martin Buber, wrote a book, I and Thou (Translated by Walter Kaufmann, Harper & Row, New York, 1996) which espouses that all human beings are created in the Divine image and are valuable. Mary Goulding, MSW, TM, emphasized another aspect of OK—OK understanding, “being” and “doing”. She taught at the Western Institute for Group and Family Therapy about being and doing strokes. The nature state of the person is OK by herself/himself. OK-ness is a part of our Being. There is a contemporary notion that one has to “do” in order to be OK. She taught trainees that each person is OK in their natural state without “doing” anything. I had a couple in my congregation who were compulsive in a loving way of giving food and other gifts to me as a single pastor. I invited them for lunch as a Christmas gift to them. To their chorus of “what can I bring”, I answered, “Nothing! Bring yourselves for I love you the way you are and this is my Christmas gift to you.” They were OK as persons and didn’t have to give the pastor a gift to be OK. They came to lunch and a wonderful time was held by all. —Robert L. Hempel, M.Th, T.A.P. *TM — Teaching Member International Transactional Analysis Association which currently is called a Teaching and Supervising Analyst. 3 Training at Western Institute for Group & Family Therapy, Watsonville, CA, USA, March 1974.